This book is an extracurricular reading material designed for foreign students to use idiomatic expressions in spoken Chinese. 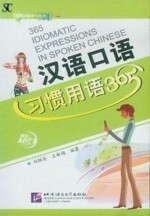 It is highly specialized, practical and readable in which 365 idiomatic expressions in spoken Chinese are selected. Each is provided with Chinese annotation and a corresponding situational dialogue and example sentences. Some are even illustrated. Pinyin and English annotation can also be found at the end of each expression for the convenience of foreign learners. An MP3 format audio CD is attached to it.